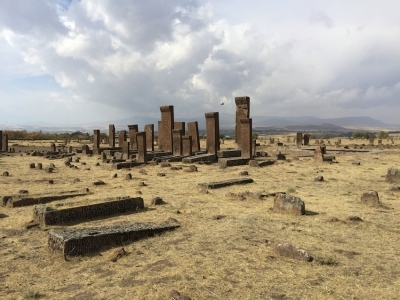 The Tombstones of Ahlat the Urartian and Ottoman citadel is part of the Tentative list of Turkey in order to qualify for inclusion in the World Heritage List. This site is scheduled for inclusion in 2020. It consists of six ancient burial grounds situated around the town of Ahlat, on the north-western side of lake Van. It is a 2 and 1/2 hours by car on a spectacular and perfect highway from Van town. Of the six cemetaries, only the biggest is well signposted, right at the entrance of the town. There is a brand new and informative museum next to it. This main cemetary is called Meydanlik. It is enormous, with tousands of tombstones made of reddish volcano turf in the middle of a large huge field. I visited this site in october 2018. Walking around this vast was very atmospheric, reinforced by a stormy weather and many crows flying around the tombstones. I was the only visitor that morning, but there were several people renovating the tombstones (basicaly removing the lichen covering them). The tombstones breathtaking, as high as 4 meters, and richely decorated with geometric, vegetal and stylized scipts. On the horizon is Nemrut volcano. I lacked any information about the 5 others cemetary, which are not signposted. There seem to be much smaller and much less imporessive than Meydanlik. Entrance is free for the cemetary, 6 lira for the small museum (worth a look to better understand the area). Taking photos is not allowed, and reminded upon entrance. Well, on a 2 km long field, this rule is a little difficult to enforce, and I still did take some picture. Ahlat city dates back to 900 BC (the Kingdom of Uratu). The tombstones date from the 12 th-15 th centuries AD, time of Ahlatshah dynasty (a turkmen local kingdom associated to the Seljuk). Only the one cemetary has Ottoman tombstone (Kale cemetary in the ruins of the Ottoman castle). The name is therefore a misnomer (as tombstones are neither Uratian, nor Seldjuk, and barely Ottoman). This site is really interesting, and very worth the visit, and to my opinion, has it's place on thw WHL. Around Ahlat town, kumbet are scattered around. Those are domed Seljuk stone mausoleum. Of the original 100 kumbets, only 15 are still standing. They don’t seem to be part of the project, but are worth a look while in Alhat.